Here’s what’s happening right now. The husband is scraping pumpkins with his fingernails. Why? 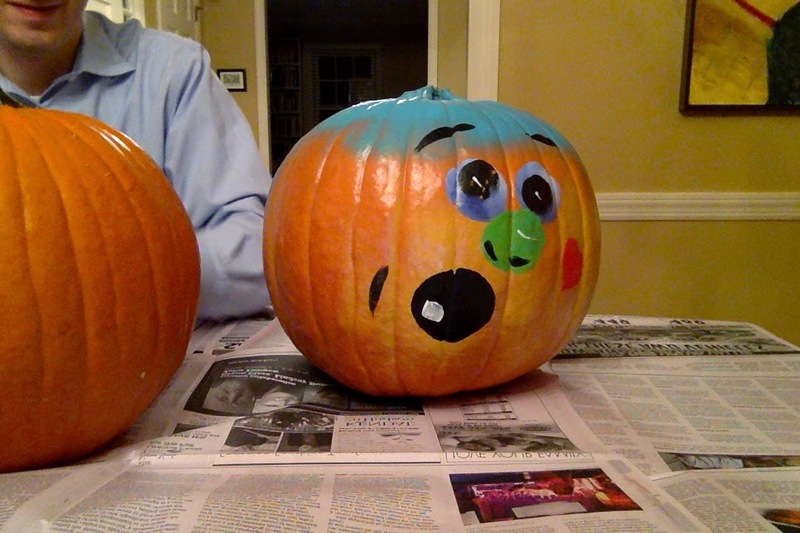 Why, because we were so lame and laggard about buying pumpkins that the only ones he could find were painted. Consequently, he is scraping off the paint, in preparation for carving them. And I am watching. I mean, after handing him a scrubby and a steel wool pad to try. I’m not completely unhelpful, just ultimately so. Last weekend was a long weekend for us. It kicked off Thursday morning, when one of us, I’m not saying which one, because it would be cruel, microwaved the butter. This wouldn’t have been a problem, except that this was special, European (French) butter, imported in an aluminum foil wrapper. As A. A. Milne might have written, this person “did like a little bit of butter for [his or her] bread.” And wanted it softened. Didn’t remember, at the unseemly hour of before school began, that metal and microwaves don’t mix. The result was a noticeable pop, and a ball of flames inside the thousand-year-old microwave we’ve moved six times. As is so often the case, especially with people, nothing seemed wrong with the microwave when you looked at it. However, mid-morning, when I wanted to reheat my coffee – I know, yuck, reheated coffee; what kind of connoisseur am I? Answer – no kind – the defects became apparent. I’m liking this damaged people, damaged microwave analogy. I could really run with it. But is it what I want to get into? The point is, if there is a point, that once you get to know even those microwaves that look fully functional, those microwaves with deluxe features, even those combination convection oven-microwave ovens, their defects become apparent. So while you’re busy crossing the street to avoid those microwaves that are shouting obscenities and weaving in your path, the ones that usually cause the most trouble are those ones that short circuit from the inside. If you don’t unplug them, they’ll burn down your house. Anyhoo. Off we went to Boston, to visit colleges and friends. The trip to Boston was a success on several levels. One important one was that we all survived the weekend at our friends’ house without having any horrible intestinal illnesses. I was kinda anxious about descending upon our friends A & T for the weekend, since we are four, and they are two. And the bathroom is one. But the real anxiety was the traumatic stress I suffered the last time we four stayed with A & T. To wit, the current 11th grader was then in preschool and her sister was still sleeping in a Pack ‘n Play; some time in the late evening, the preschooler commenced vomiting, which she continued doing every forty-five minutes or less until we managed to load ourselves into our car and head back out the Mass Turnpike at 7:30 in the morning. I have never recovered from this terrible experience. The guilt of inflicting ourselves on our friends. The whole thing was just, you know, yucky. So I had residual apprehension about the four of us going there again, even though, mirabile dictu, this didn’t cause our friendship to end, even though A & T remained undeterred in their decision not to have children. Perhaps this episode underscored for them the rightness of this choice. I can’t say. What I can say is that, while since then, I have slept under their roof and they under ours, this particular sleeping arrangement had not occurred in the intervening twelve or thirteen years. Now, we have cancelled out the past, with a successful visit, during which nothing untoward happened, unless you consider the children observing the adults acting like, uh, children, children who drink lots of beer, untoward. All of this dwelling on the dark and negative, Readers, has a point. The point is that sometimes negative thinking can lead to success. I was reminded of this by a recent piece in the NYTimes, “The Problem With Positive Thinking.” This piece reminded me of two things I’ve learned. One, that an idea worth writing about once is worth writing about repeatedly. It’s worth revisiting, like Boston. Or your fears. This is good news, don’t you think? I do. Two, this idea that “the key to success is to cultivate and doggedly maintain an optimistic outlook,” has often prevented me from feeling like I can succeed. You see, I have a bit of a problem with the cultivation and doggedness of optimism. For a long time, I tried to convince myself that I am, at heart, an optimist. And I may, indeed be. However, I am learning that this buried nugget of optimism is not what my closest and dearest friends associate with me. It may be too well-buried. For example, just this weekend, gathered ‘round the dining room table with our friends, spurred by a glass or two of Italian wine, I remarked that I think I’m fairly optimistic. “You are?” One of my so-called friends said, in an insulting tone of incredulity. I said, “Well, it’s true that the husband and I often have different reactions to the same stimulus.” Well, those weren’t my exact words. Who can recall exactly what one says when one is drinking Italian wine? More or less, I said that for example, when I see our dog lying with his head on his paws, I’m filled with a terrible feeling that he’s bored and unstimulated. “Look at that poor, miserable doggie,” I’ll say, and feel that I have to do something to make him feel better. The husband, on the other hand, comes into the room, looks at the dog in the same pose and says, “Look at how happy he looks.” Then he goes off to play the piano, or do a crossword puzzle, without a nagging feeling of guilt and failure. I have felt much shame about that negative tendency in myself, thinking it has doomed me to failure. However, the beauty of this article was that it revisited this idea and declared it untrue. It turns out that positive thinking can cause a person to relax , to lose energy, and therefore to lose motivation. Now, this idea isn’t actually new. Two of my favorite psychologists, Carol Dweck and Heidi Grant Halvorsen, PhD, her onetime protégé, are big into how your mindset affects your ability to achieve success. HGH, PhD, in particular, has examined the ways that accepting your tendency towards pessimism can help you attain success. In other words, if you’re going to be a negative thinker, use that to your advantage, by figuring out what obstacles may interfere with you reaching your goal, and how to overcome them. According to this new article in the NYTimes, the best approach to a goal is twofold, a technique called “mental contrasting.” In mental contrasting, you balance positive and negative thinking. You envision a positive outcome; but you also consider the potential obstacles. You are, in short, hopeful, but also realistic. I think I’m that. Maybe. After my morning affirmations. Hmmmm. How the heck are we to know what’s reasonable and potentially attainable for us? Beats me. I guess that’s another article. C’mon, NYTimes, help me out! By the way, I lasted five days without a microwave. Three of those days we were out of town. Where to begin? I guess I'll start with the oldest thing, which is your last family visit to our house. These things happen with small children. A and I have barely given it a second thought. Lots of people have thrown up at our house! And if there were ever an advertisement for the benefits of spawning, your kids are it. Both are intelligent, funny, and polite, which all children should be if they possibly can be. Secondly, I assume that I am the insultingly incredulous so-called friend, but as you said, it's difficult to remember exactly who said or did what. I consider myself pretty optimistic, too, which is maybe why I've had such little success - if, that is, you count success in gold bars. If you count it in happiness, I'd say I'm in the 1%. What that might mean to the psychologists is anyone's guess but mine. I can't recall who was insultingly incredulous - but likely it was you! Or, perhaps I took a little creative license there, for humorous effect. I'm not above that.